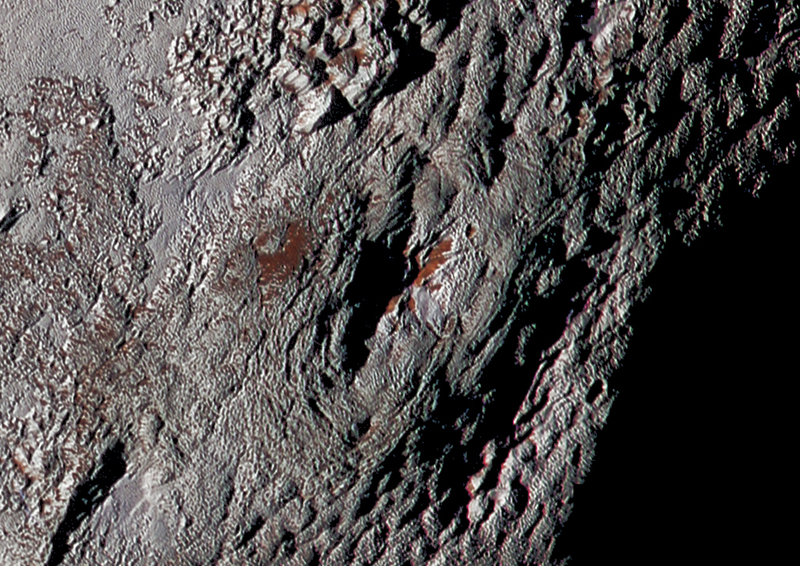 This bumpy wrinkled pucker is actually an enormous ice volcano — i.e., a cryovolcano — on the surface of Pluto, imaged by the passing New Horizons spacecraft on July 14, 2015. Informally called Wright Mons, the feature is about 90 miles (150 km) across and 2.5 miles (4 km) high, about as high as some of the tallest Alps. The entire volcanic mountain spans an area half the width of the state of Massachusetts! The fact that there is only one visible impact crater on Wright Mons (to the upper right of the central “caldera” in the top image) indicates that the feature is relatively young, like the surrounding terrain. If this is a cryovolcano, it was likely active not that long ago in the Solar System’s history! Wright Mons sits at the southwestern edge of the bright “heart” feature first seen as New Horizons approached Pluto in July 2015. Called Sputnik Planum, this reflective region is a patchwork of finely-textured nitrogen ice flows that’s conspicuously lacking in craters. Scientists suspect this indicates an ongoing process of slow-motion “cryoconvection” that carries slushy nitrogen and methane up from a warmer interior to the upper crust, where it freezes solid and renews the surface. If this is the case, the surface around Sputnik and Wright could be a mere 10 million years old… by comparison, many of the features found on our Moon are over 2–3 billion years old. Read more here. These high-resolution images were acquired by the New Horizons spacecraft’s Long Range Reconnaissance Imager (LORRI) on July 14, 2015, from a range of about 30,000 miles (48,000 km). 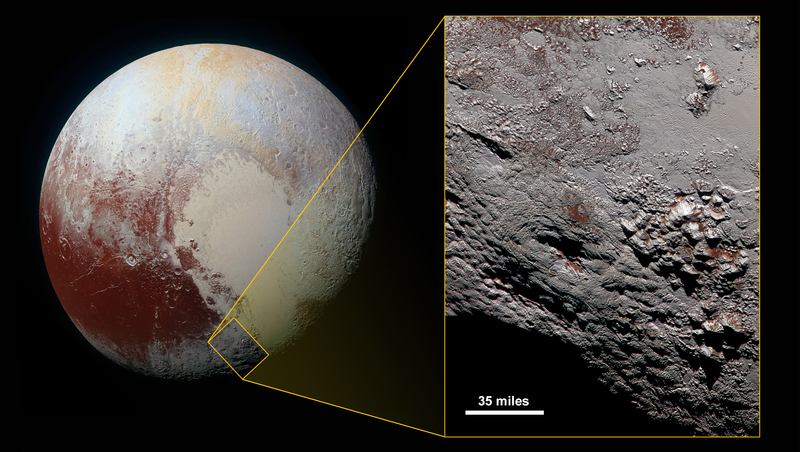 It resolves features as small as 1,500 feet (457 m), and the entire inset scene is 140 miles (230 kilometers) across.